The Girvan Distillery on the Ayrshire coast produces one of the industry’s finest and most sought after grain whiskies. The Girvan site is also home to Grant’s Scotch whisky and the Hendrick’s Gin Palace and now boasts a new malt distillery, Ailsa Bay and a state of the art laboratory to help William Grant & Sons with its innovative programme of new product development. In 1963 our first Girvan Patrent Still ran with spirit. Almost three decades later in 1992 we installed a pioneering new still which we named 'No. 4 Apps' - a distillery term for 'apparatus'. This unique still, operated under vacuum, permits distillation at low temperatures. The whisky has been matured in ex-bourbon American Oak casks, and there is no age statement on the bottle. 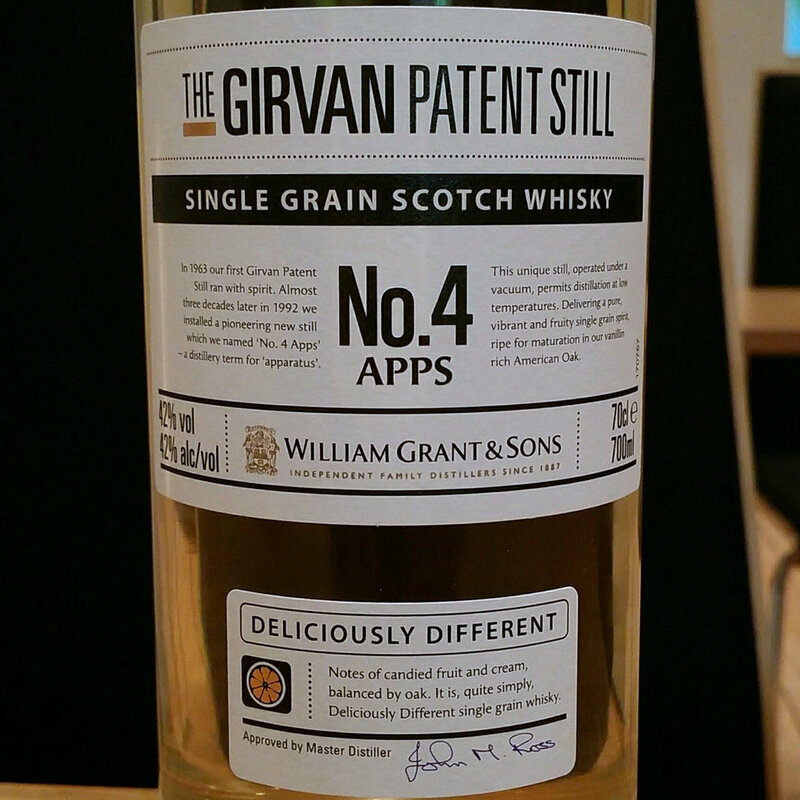 The Girvan Patent Still No. 4 Apps is available in Norway at NOK 750 (item number 1897301). It is not currently available in Sweden. Nose (21/25): Light and fresh. Banana and vanilla are the most prominent right off. Then bubblegum, marshmallows and fruit drops. Lemons. It appears a bit young, but quite well-balanced. Taste (19/25): Oily and smooth mouthfeel. Quite spicy on the attack - lots of pepper and a handful of ginger. Vanilla and mild citrus notes. Quite sweet. Finish (18/25): Fizzy and fresh. The initial sweetness dies off, and the finish is more metallic and oaky. Short to medium long and quite warm. A bit thin as it dies off. Balance (19/25): Quite decent for such a young single grain. I do believe this is better served in a cocktail on a hot summer day.